Battle of the Sexes is the ace Blu-ray of the week. “Directors Jonathan Dayton and Valerie Faris, along with cinematographer Linus Sandgren, gave this production an appropriately ‘old school’ 1970s ambience by shooting on film (with an eventual 2K DI),” Blu-ray.com reports. That gives this transfer a nicely thick, somewhat textured look, with a nicely resolved grain field throughout, but a lot of this presentation tends to be on the soft side, with a kind of odd prevalence of rather dimly lit scenes (even some of the outdoor material doesn’t look overly bright). That tends to keep fine detail levels from really popping some of the time, though when lighting conditions allow and close-ups are employed, things perk up considerably. “This is a pleasing video presentation that boasts plenty of high level detail, enriching contrast, natural colours and dimensionality,” AVSForums says. Blacks are punchy and stand out when onscreen with mixed content. Visual perspective in low lighting and darkened areas is estimable. The combination gives dark scenes appreciable depth. Images are pleasing and perfectly suited for the source material while exhibiting no signs of video related artifacts. 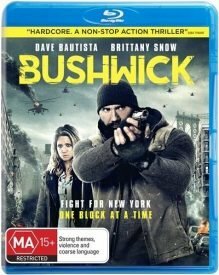 The rest of the week’s releases are direct to disc, including The Belko Experiment (“a first-rate picture”), Bushwick (“a decent looking picture”), The Vault, Mythica: The Dragonslayer, Charlotte: Volume 2 (episodes 8-13), Log Horizon – The Complete Series and WWE: NXT: From Secret to Sensation.